Whisk together wet and dry ingredients separately, then mix together. Notes from (my husband) Thomas: I asked Anne to create a homemade pancake mix that I could add wet ingredients to when I wanted to whip up a few hearty and healthy pancakes in the morning before work. 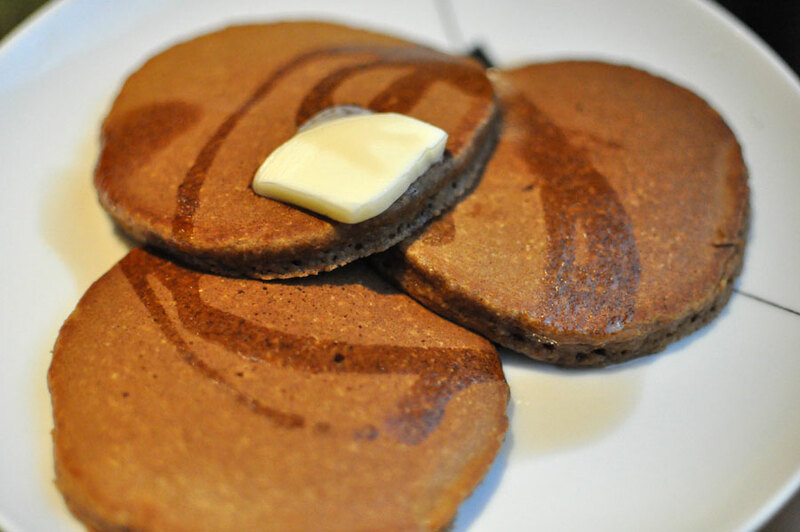 Anne liked this recipe (after removing some of the oil to make them healthier) because it has some pumpkin pie spices which give the pancakes some nice flavor before adding any topping. The problem is that the molasses makes them “brown up” pretty quickly so it’s important to keep the flame low. Also, they are very hearty – not everyone’s favorite way to make pancakes – but if that’s your thing (yes!) these are delicious and worth trying for the whole family. I love adding walnuts to pancakes so I throw a few in when I’m making them.